Amid Board Game Boom, Designers Roll The Dice On Odd Ideas — Even Exploding Cows Sales of hobby games grew about 20 percent last year, and crowdfunding sites are opening doors for indie game designers. All this is paving the way for more than a few new and, well, inventive games. "It's easier for me to sell direct to a customer now," says James Ernest, co-creator of the game Unexploded Cow. The board game is one of the most popular created by Ernest, who's made ample use of crowdfunding sites. When you play a game, you have to learn some rules, right? Well, same goes for designing a game. And here's one rule: No idea is too wacky. "That's a game where you've discovered two problems with a common solution," says the game's co-creator, James Ernest. "There's mad cows in England and unexploded bombs in the French countryside, and you're going to bring them together and solve everybody's problems by blowing up a bunch of cows. " Using cows with a debilitating brain disease to get rid of leftover bombs — for most people, that's just an absurd joke. But Ernest designs board games for a living. He and a colleague took that weird idea and came up with a card game. Each player manages a herd of sick cows and tries to make money blowing them up. 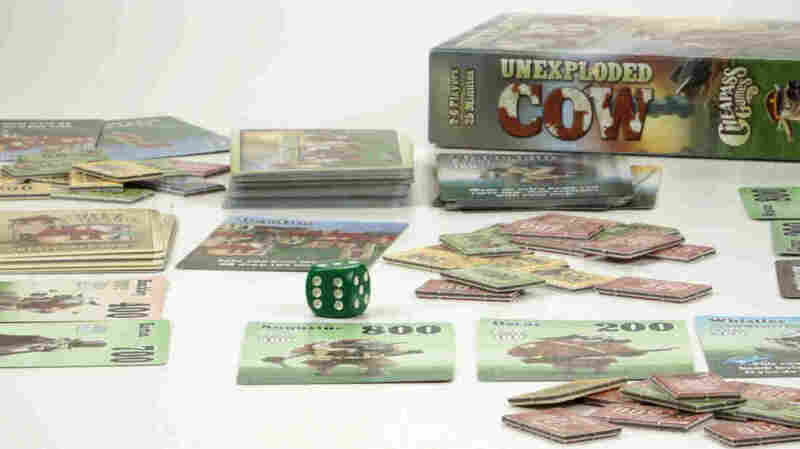 That game, Unexploded Cow, is now one of the most popular he's created. And it's part of a growing trend. Even as smartphones seem to have us addicted to screens, people are increasingly choosing to sit down at a table, face to face, to play a board game. Sales of what the industry calls hobby games grew about 20 percent last year. But it's not easy to go from that first idea to a successful tabletop game. You need people to test out your ideas. Every other week, Ernest and fellow game designers meet at a board game store east of Seattle. It's a crowd of mostly guys, casual dress, ample facial hair. Many have day jobs in the video game industry. The Seattle area is a hub for tabletop game design. Dungeons and Dragons is made here. Pictionary and Cranium were both invented here. But that was decades ago. These days, game designers have learned a new rule: The crowdfunding site Kickstarter is your friend. Ernest just raised $1.3 million for a strategy game he calls Tak. "It's easier for me to sell direct to a customer now," Ernest says. "But Kickstarter makes it even more easy, because now I don't even take the financial risk on the print run." Ernest lines up buyers and then produces the game. People have pledged half a billion dollars for games on Kickstarter, including the wildly popular Cards Against Humanity. At Digipen Institute of Technology outside Seattle, students are learning the fundamentals of board game design. The school is known for video game design, but in a class taught by Jeremy Holcomb, the students — including Shiloh Liedtke — get to create non-electronic games. "It's so gratifying to sit across from somebody when they make a really smart move or a good choice or something, and you're like, 'No! That gets in the way of everything I've been trying to do here!" Liettke says. "If they're facing another screen 1,000 miles away, you don't really get that interaction as much." But Liedtke's also learning another rule: Even though the board game industry is growing, it's still dwarfed by the video game industry. So she thinks that's where she'll probably wind up. Still, if she does, Liedtke could join other designers who moonlight making good old-fashioned board games.